Multi-strain probiotic and lactic ferment complex (7 strains). Formula based on natural strains of Bifidobacteria (residing in the colon) and Lactobacillus (residing in the small intestine), thereby ensuring complete intestinal tract coverage. Age-specific formula (Age 50+) that includes 3 strains of Bifidobacteria in order to compensate for the natural decrease in bifidobacteria species. Contains 8.5 billion active cells, concentration guaranteed until expiry date. The population is aging and life expectancy increases… When one relies on the many activities and resources offered to the elderly population, the body seems to be a machine refusing to slow down. One of the many changes to occur over the years is the natural and eventual decay of bifido-bacterial species that reside in the colon. The golden age is not always shiny, with a weakened immune system in a context of more frequent hospitalization (with the risk of infection) and increased antibiotic prescriptions (then diarrhea related to its use). Our 50+ probiotic contains 8.5 billion active cells per capsule, in a formula that takes into account endangered bacteria at this age. 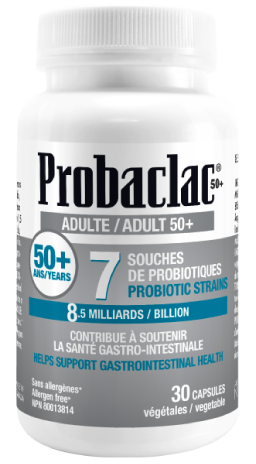 People over the age of 50 have everything to gain from a probiotic supplementation, to replenish the good bacteria lost over time. 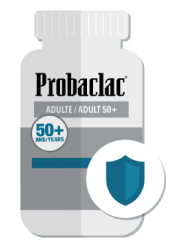 How to take Probaclac adults 50+ ? Probaclac accompanies you your whole life. The mixture of strains helps to prevent diarrhea and constipation, and to strengthen the immune defenses for the next 50 years. Due to the high proportion of bifidobacteria, the supplement is also useful to people who suffer from malabsorption (in case of allergies or intolerances) and/or a colon problem (Crohn’s disease or irritable bowel syndrome).